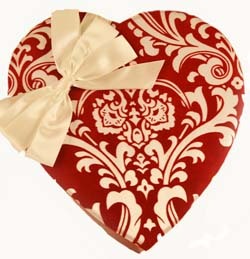 A classic, pretty heart flocked with whirls and swirls, and topped with a pert, white bow. Filled with Dorothy's an assortment of gourmet, hand-crafted Swiss chocolate pieces. This is definitely the gift for the Valentine with flare! Dimensions: 10 1/4" x 9 1/4" x 1 3/4"